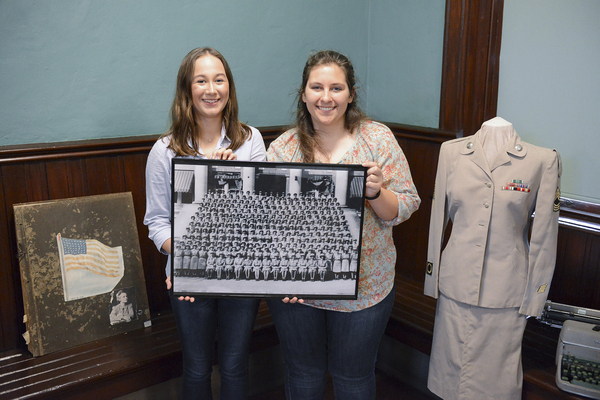 Kierstin Smith, Stephen F. Austin State University DeWitt School of Nursing student, and Sophia Savage, SFA counseling graduate assistant for SFA's Center for Regional Heritage Research, hold a class photo of the Women's Army Auxiliary Corps taken on the steps of the Austin Building on SFA's campus. Through the CRHR, Smith and Savage will host an exhibit on the WAACs featuring poster presentations and artifacts at the Nacogdoches Railroad Depot beginning April 26. Stephen F. Austin State University's Center for Regional Heritage Research will host an exhibit on the Women's Army Auxiliary Corps at the Nacogdoches Railroad Depot beginning April 26. Sophia Savage, a counseling graduate assistant for the CRHR, and Kierstin Smith, a DeWitt School of Nursing student, developed the idea of creating a WAAC exhibit. Savage and Smith wanted to shed light on a piece of Nacogdoches history that is often overlooked. "There's a lot of history in Nacogdoches and so much of it can easily be missed," Smith said. "Nacogdoches has a historical past that hasn't been fully explored, specifically the Stephen F. Austin State Teachers College WAAC Branch No. 1 Army Administration School." After learning of the WAAC's involvement during World War II, the duo wanted to create a unique exhibit to educate the public as to who the WAAC's were. Mark Barringer, chair of SFA's history department and director of the CRHR, believes this exhibit will further establish the WAACs importance to the area. "As Dr. Jere Jackson has documented, the WAACs saved this institution," Barringer said. "If we want to honor and remember them, we need to preserve everything we can now. This is just another part of maintaining as complete a record as possible." Savage and Smith have spent months gathering information and creating the exhibit that will display various memorabilia, including a WAAC uniform. They worked with CRHR operations manager Tiffany Gauntt, public history faculty members and the City of Nacogdoches Historic Sites Department throughout the process. Jessica Sowell, assistant historic sites manager, has partnered with the CRHR on multiple projects during the past two years. She has primarily helped gather artifacts for this exhibit. "As a facilitator, I just helped handle the museum side of things. Sophia and Kierstin have done great work on their own," Sowell said. The CRHR got its start in 2006. While the staff members and collaborating faculty members primarily work on local and regional historic sites, they also have external research partners in the U.S., Brazil and Australia. "One of the great things about the CRHR is we get students from other disciplines, like Sophia and Kierstin, who get invested in what they're researching and receive hands-on experience in new settings," Barringer said. "I'm very proud of these students." Both students said that they had no prior training on creating an exhibit before the process began. Since they were not history students, either, they had to learn how to conduct the research on their own. Throughout the process, they have developed a deeper appreciation for history. "Before I started working in the Center for Regional Heritage Research, I wasn't very interested in history; but now, I really enjoy it," Smith said, "It's so important to know about events and people because they helped make the world what it is today. I really hope this exhibit not only interests people about the WAACs, but also encourages them to dig into other areas of history." A guest speaker from the WAAC's Veteran Association will serve as guest speaker on opening night, April 26. Refreshments and food will be served from 6 to 8 p.m. The depot is located at 101 Old Tyler Road. The depot's regular hours are 10 a.m. to 2 p.m. Wednesday through Saturday, and admission is free.